In a given set of an environment (controlled or uncontrolled), supply chain risks either amplifies or they simply collude with each other to form a greater risk all-together. "What if", the very environment itself plays a role of catalyst and eventually pushing the outcomes where consequence may be known but cannot be contained? "What if", risk mutates beyond the controlled environment? What if, ambiguity remains radioactive across the decision-making chain? To understand the crux of "What if," one has to look beyond the alternative versions of supply and demand, based on simulations created by the micro-level information blocks, which are extremely critical for the businesses to sustain their own growth in an ever-evolving digital landscape. Just imagine, having a sudden wake-up moment and emulating a "eureka" with the realization of the existence of "data" within the organization and beyond. In other words, it could end up as an organizational nightmare due to this sudden awareness of relationships with the losses, which were hidden in the first place itself, as the teams were focusing more on top-line targets by taking underbelly hits without knowing the consequences. Well, better late than never. Let's accept it, "Digitization" of "Supply Chain Management (SCM)" is not at all a new topic. But yes, it did transcend from our subconscious mindset to conscious one very recently. If we look back in a recent timeline, Intel proposed and propagated a concept called - "Inventory in Motion" in the early 2000s . In Intel's vision of inventory in motion, products would be shipped as soon as they are built, before orders are received. Paperwork would be sent electronically to the hub closest to the customer so that it could be put together with products when they arrive at the hub - all electronically. 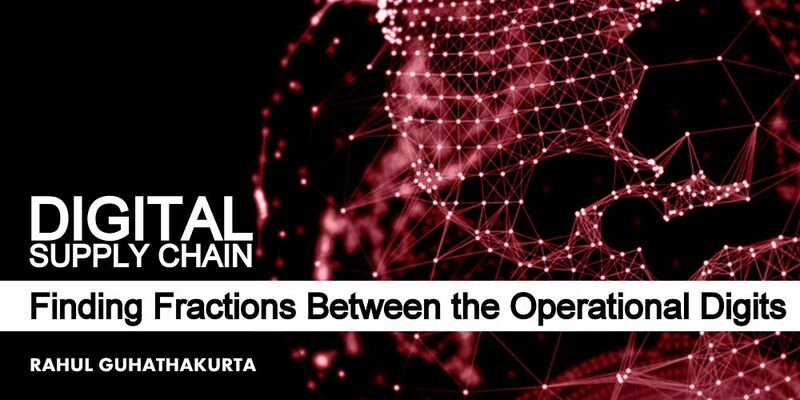 Generally, it has been found that big and well-invested organizations are often using state-of-the-art technologies to achieve complete end-2-end digital supply chain by constantly redesigning their operating models and go-to-market approaches. They are re-plotting their new routes to customers, decentralizing their in-house activities, and substantially trying to speed up the delivery process by reducing the expected time of arrival (ETA) at customer's end. The overall bottom line is to know the losses beforehand and mitigate them before it becomes too huge for anyone's capability to solve. Primarily, in any given supply chain framework, there are four fundamental "digits" in its dy/dx equation where "deltas" of transformation exist. Those are; identification of inventory item, authentication of the inventory item, location of the inventory item, and automatic data acquisition (ADA) related to that inventory item. If we consider an example of an existing on-hand order, the best way to full-fill it will completely depend on the selection of efficient delivery patterns and matching it with locations based on relevancy. Also, when it comes to delivery, any well-oiled supply chain application always gives a major thrust to automatic data acquisition (ADA) rather than authentication. In most of the ADA applications, inventory objects such as items, cases, and pallets are tracked automatically and the captured data is used to drive the enterprise applications such as SCM systems, customer relationship management (CRM) systems, and enterprise resource planning (ERP) systems. In the mid-2000s, organizations started experimenting with RFID (Radio Frequency Identification) tags to answer the authentication part of the question which itself quite a "forward-looking" approach at that time, generating greatest opportunity for use of the digital supply network. And So, what are the fractions we are looking at? As an industry function, the supply chain management is witnessing a paradigm shift due to ever evolving digital landscape such as the rise in cloud-based technology solutions and creating an Industry 4.0 ecosystem. Such technological approaches are pushing the level of automation a step further by deploying machine learning algorithms, which can teach an inventory management system to predict and forecast order requirement. Industry 4.0 is defined by interconnectivity - devices within and outside a facility is connected to each other and to human interfaces, providing real-time data from a vast array of sensors. Paired with advanced analytics and machine learning, this ecosystem of sensors, devices, and humans is incredibly powerful. No wonder, technology is acting as a buffer against market volatility as it enables the organization to scale up or down the level of services and at the same time provides necessary customizations to support an organization's rapid expansion plan. The absolute perfect data is a myth. A solid data consistency is the need of the hour. So, before taking a leap of faith, it's utterly important for an organization to have a crystal clear "enterprise-level data strategy". The rise in the sheer volume of data churned by single/multiple supply chains and their newly formed digital reporting and analytics system is not only overwhelming — it has the potential to harm by adding a counterproductive level of complexity that leads to chaos . On top of that, the rise of multiple incompatible data analysis tools, finding a way to obtain a unified enterprise view of the disparate data in their systems are always going to remain one of the added challenges. A focused approach to the handling of data helps organizations avoid going stray from the path by following non-causal correlations that can emerge from large data sets. And it makes ongoing and future analysis and interpretation more manageable and, thus, better able to consistently provide the business insights companies need to fuel their digital business models and the supply chains that support them. Data are ideas, communique about reality - not the reality itself. So, when designing a supply chain network map, the backbone of any business, one needs to read the data and its analytics right or it will turn out as an Achilles' heel. From a general point of view, there are at least two overriding requirements for an intelligent computer-based decision-making environment. The first requirement relates to the representation of information within the environment. The software must have some level of understanding of the information context that underlies the interactions of the human user with the environment. This is fundamental to any meaningful human-computer interaction that is akin to a partnership. The level to which this understanding can be elevated will largely determine the assistance capabilities and essentially the value of the software environment to the human user. The second requirement is related to the need for collaboration. In a broad sense, this includes not only the ability to interact with human stakeholders who play a role in the supply-chain, such as planning and management personnel, vendors, remote distribution centers, shippers, and customs officials but also non-human sources of information and capabilities. All of these interactions between human participants in the logistic processes, data sources, and software-based problem-solving capabilities, must be able to be performed seamlessly without the user having to be concerned about access protocols, data formats, or system interoperability issues. So, when it comes to select a "decision support framework" to support multiple supply chain data sources, one should refer to industry-approved SCOR Model . It is based on three major principles: process modeling/re-engineering, measuring performance, and best practices. There are five distinct process-modeling building blocks to the SCOR model: plan, source, make, deliver, and return. However, SCOR model itself is a hierarchical model which integrates supply chain by covering all interactions with customers from incoming order to incoming payments and all material flow, the production processes as well as all interactions with the market from resource delivery from the supplier to the delivery to the customer. The basic role of any data analytics platform is to enhance the control points across the supply chain by improving the margins and increasing the revenues by managing the working capital in an optimum way. To mitigate the divergences in the chain, it's better to deploy one (over the top) data analytics platform which will act as a silo and aggregate the data from the multiple sources. And, with growth in advanced machine learning technologies based on Natural Language Processing (NLP), siloed data can be automated, aligned/collated, and visualized at various hierarchical levels of an organization. In real-time, targets can be set at different nodes of supply chain channels through the insights generated via predictive analytics. These targets may form a part of the management-by-objectives in an organization, along with pre-defined tolerance factors. Now, when an actual value exceeds one of these tolerances, a corrective trigger will get fired seamlessly across the platform. One such recommended set of tools comes from IBM's stable - the IBM Predictive Operational Analytics (based on SPSS and Cognos) - when it is collectively deployed, it can help supply chain executives to determine the correct inventory levels for products and materials at virtually all stages along the supply chain. These solutions can help organizations balance the tradeoffs between carrying costs and customer service levels—and between production volume and capital reserves. Consecutively, by analyzing the data from ERP systems and CRM systems, plus logistics information from factory floors, distribution centers, and retailers, organizations can gain the insight they need to make better, smarter decisions and compete more successfully. As we know, mathematically, fractions can be proper or improper. Proper fractions are those whose numerator is less than the denominator, therefore, its value is between zero and one. Moreover, improper fractions are those whose numerator is greater than the denominator, that is, its value is greater than 1. So, it's critically important for a supply chain team to know these fractions in "proper" manner so that they can derive maximum value from the investments and at the same time, the team should also work to convert the "Improper" fractions into mixed fractions and vice versa as per the need - by having a clear understanding of the digital aspects of a supply chain network with regards to the conversion of data into actionable insights. Rahul Guhathakurta, Founder/Publisher at IndraStra Global. He tweets at @rahulogy.